With the approach of the elections for the Supreme People's Assembly of the DPRK the Western imperialist media is spreading all kinds of lies and slanders about their nature and purpose claiming that they are sham elections. In fact elections in the DPRK are taken very seriously indeed and there is a high level of popular participation in them from the moment they are announced. It is not a case that people are just approving a list of imposed candidates. In the DPRK the candidates for elections are genuine people's candidates who are nominated through mass meetings of electors . In the DPRK it is quite possible that a candidate for the Supreme People's Assembly may be your workmate or neighbour . Whereas in elections in capitalist countries the candidates are often career bourgeois politicians very remote from their actual electorate often living miles away from the areas they represent. In capitalist countries the electoral turnout is low , in the US it was only 57% in the last presidential election and in the UK 65% . 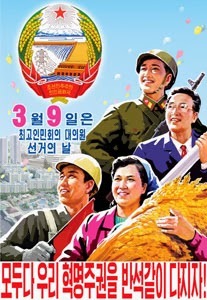 In the DPRK turnout was 99.98% showing that the DPRK 's elected representatives have a real mandate from the people. In the DPRK it is free of charge to stand for election whereas in the UK you have to pay a deposit of £1000 which automatically excludes poorer people from standing . Generally elections in capitalist countries are about money with the candidates who spend the most money winning . Elections in capitalist countries are characterised by fraud , corruption , vote-rigging and gerrymandering whereas elections in the DPRK are conducted fairly under the guidance of a central election committee composed of representatives of mass organisations. Election Results: 100% voted for Kim Jong Un! We Will Vote for the Socialist Nation! News Analysis on Deeds of "Human Rights Judge"